Polk Audio is certainly no stranger to the soundbar genre. The company has been producing mid- to high-end soundbars for many years now, and a quick visit to the soundbar page at PolkAudio.com shows six current models, ranging in price from $350 up to $1,000. The Polk soundbar lineup consists of two series: the Component Home Theater (CHT) Series includes passive soundbars that are sold primarily through specialty channels, while the Instant Home Theater (IHT) Series consists of active soundbars that you can find through mainstream retailers like Amazon and Crutchfield. The most recent addition to the IHT Series, the SurroundBar 9000, is also the most advanced active soundbar that Polk has developed to date. • Read more soundbar reviews by the writers of HomeTheaterReview.com. • See more review in our HDTV Review section. As the name suggests, active soundbars include all of the necessary amplification and signal processing to deliver the audio goods. There's no need to add an AV receiver; just plug your sources directly into the SurroundBar 9000, and you're good to go. This five-in-one speaker uses Polk's SDA Surround technology to help broaden the soundfield and create a better sense of envelopment than you'll get from many of the lower-priced 2.1-channel soundbars on the market. 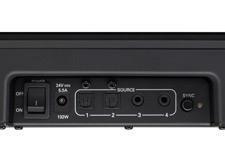 As with all of the IHT soundbars, the SurroundBar 9000 comes with a wireless subwoofer to flesh out the low end. 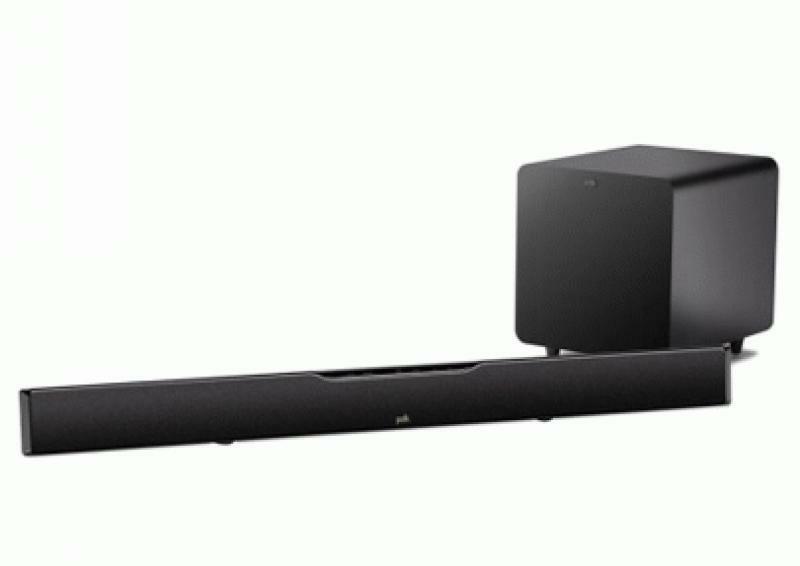 The package price for both the soundbar and subwoofer is $799.95. Given the small stature of both the SurroundBar 9000 and its accompanying subwoofer, I was a bit taken aback by the size of the box I received that contained these components. As it turns out, Polk is just being extra careful, as everything is carefully packed with lots of buffer space to protect the products during transit. The SurroundBar 9000 measures 44.5 inches long by 3.75 inches high by only 2.25 inches deep and weighs eight pounds. This is the longest of Polk's active soundbars, so it's a better visual compliment to a larger-screen flat panel than Polk's other IHT models (which have a length of 35 inches less). Of course, people will love the bar's super-slim depth, but I really appreciated its 3.75-inch height. The soundbar was short enough that I could simply set it on the tabletop directly in front of my Panasonic TV without blocking any of the screen (it still blocks the TV's IR receiver, though). Two rubberized feet are attached to the soundbar so that it can sit stably on a flat surface right out of the box; you can peel off these feet and move them to different positions on the bar, or you can remove them entirely and use the keyhole slots on the backside to wall-mount the soundbar (mounting kit not included). 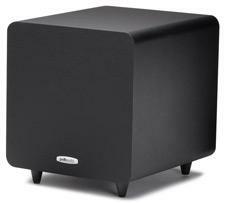 The subwoofer, meanwhile, measures 13.5 high by 12 wide by 13.5 deep and weighs 18.2 pounds. The sub has no connections beyond the power cord; it communicates wirelessly with the soundbar at a distance of up to 50 feet. The SurroundBar 9000 has a satin black finish with a glossy black trim around the front edges and a black cloth grille. The well-built cabinet is constructed of ABS and Plexiglas, with two ports on the backside. Front and center, you'll find controls for power, source, mute, volume, and learn (more on this in a moment). The connection panel offers two optical digital inputs and two analog 3.5mm jacks, and the package includes one six-foot optical cable, one mini-plug to mini-plug cable, and one mini-plug to RCA cable. The SurroundBar 9000 lacks HDMI inputs, and it does not offer integrated Bluetooth support to wirelessly stream music from compatible sources like a smart phone or tablet, a feature that is available on the lower-priced SurroundBar 5000 ($399.95). As I mentioned in the introduction, the SurroundBar 9000 is the most advanced of Polk's active soundbars. For one, it has more power; each of the bar's eight drivers (three 0.5-inch silk dome tweeters and five 2.5-inch midwoofers) has its own dedicated 45-watt amplifier, for a total of 360 watts. The subwoofer has a larger woofer and a more powerful amp than any sub in the IHT Series: an eight-inch down-firing long-throw woofer and a 150-watt amplifier. The SurroundBar 9000 accepts both Dolby Digital and DTS 5.1-channel signals through its digital audio inputs and, more importantly, it decodes and outputs them in 5.1 channels as well. Obviously, if you count the drivers, you can see that the speaker doesn't have a dedicated tweeter/midwoofer array for each of the five channels; instead, the SurroundBar 9000 relies on the most advanced DSP engine that Polk has ever put in a soundbar (capable of 160 MIPS, or millions of instructions per second) to analyze the signal and divide it between the different drivers. Polk was kind enough to provide me with a tech brief that explains everything the DSP engine does, most of which I won't try to reinterpret for you here. Allow me, though, to hit some of the major points. The center tweeter/midwoofer array is dedicated to center-channel reproduction to ensure strong, stable, intelligible dialogue. The three drivers to left of center share front-left and surround-left duties, while the three drivers to the right share front-right and surround-right duties. But wait, there's more. Because dialogue intelligibility was one of Polk's primary goals with this soundbar, the company developed Optimized Center Array technology that actually has all five midwoofers contributing to center-channel performance, using processing techniques that I'm not even going to try to describe to help improve center-channel clarity across a wider listening area. But wait, there's still more. I was surprised when my Polk rep told me that the system crosses over everything at 80Hz to the subwoofer; the company wanted to preserve the THX-recommended 80Hz crossover, but how can you ask a speaker that uses 2.5-inch midwoofers to handle info down to 80Hz? Through a technology that Polk calls Full Complement Bass, all five midwoofers also reproduce the sum of the left, center, right, and surround channels in the range from 80Hz to 200Hz. This is designed to provide the equivalent surface area of a 5.25-inch driver that's better able to handle lower-midrange information. But wait, there's yet still more. The soundbar also employs Polk's SDA Surround technology that applies the principles of stereo crosstalk cancellation to the multi-channel signal to help broaden the soundfield and produce a better sense of envelopment without dedicated surrounds. Polk soundbars do not rely on boundaries to try to direct reflected sounds to certain locations in the room. With all that tech-speak out of the way, let's talk setup. Frankly, it could not have been easier. I simply set the SurroundBar 9000 on the TV stand in front of my TV, connected my DirecTV receiver and OPPO Blu-ray player to the two optical digital inputs, plugged in the soundbar and sub, and turned them on. The soundbar and sub automatically sync with one another (the manual does include instructions to re-sync the two if they lose their connection, but that never happened during my time with the system). An even easier setup is to run a cable from your TV's optical digital audio output (if it has one, and most do) into one of the bar's digital inputs. However, many TVs will only output HDMI signals (the ones sent from your sources into the TV) in PCM form through the optical output, so you lose the Dolby Digital and DTS 5.1 coming straight out of your sources. If you use your TV's Web platform to stream video-on-demand content from the likes of VUDU or Netflix, then you should treat the TV as a source and run that optical digital cable anyhow; you will get available 5.1-channel signals from the TV's internal sources. I began my evaluation in my family/theater room, which is a more enclosed (but still large) space that measures about 18.75 x 12 x 7.75 feet. I then moved the system to my living room, a wide-open space that feeds into the dining room/kitchen/stairway, which is where I would more likely use a product like this. The SurroundBar 9000 comes with a tiny IR remote that includes buttons for power, source, mute, overall volume, and subwoofer volume. One nice perk is Polk's Smartbar technology, which allows you to quickly and easily set up your TV or cable/satellite remote to control the soundbar's power, volume, and mute, using the "learn" button on the bar's front panel. Read about the performance of the Polk SurroundBar 9000 on Page 2.